Your Lie in April is easily one of the most touching, emotional stories I've ever had the privilege of watching. 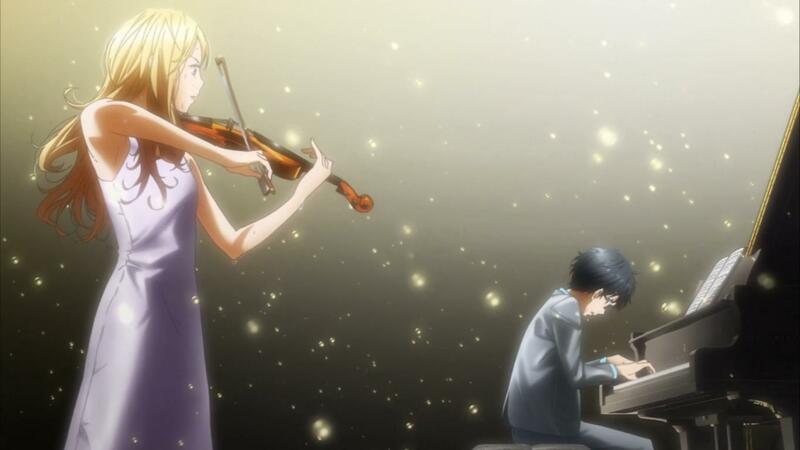 The story centers around Kousei Arima, an emotionally closed off piano prodigy in middle school dealing with the recent passing of his mother, who comes across his total opposite, a beautifully charismatic violinist, Kaori Miyazono, as she changes his world starting that one April afternoon. Arima, who hasn't played the piano in two years, is goaded by Kaori to rediscover his undeniable talent and bring it to the stage once more so they can play their music together. Supported by his two best friends, Tsubaki Sawabe and Ryota Watari, Arima goes on a journey of reclaiming his life and finding solace in the present while shedding the sorrows of the past. Throughout the 22 episodes, the gang of four deal with the common coming of age moments that anyone their age goes through at one point or the other. Forgiveness, greed, jealousy, competition and uncertainty are just some of the underlying themes in this wonderful tale about young love. During Arima's journey to return to his true self, roadblocks from past musical rivals and terrifying flashbacks of his childhood haunt him until he finds the reason he wants to play the piano, the reason he has to play the piano again. The final five episodes of this amazing journey tug at the heartstrings, make you grasp for tissues and evoke a real emotion for these beautifully illustrated and developed characters. For these characters, we find out that life isn't fair, but it does move on. It just takes one thing to get the ball rolling. Speaking of the illustrations, the colors used in this show are mesmerizing. Whether it be a sunny spring day or a darkened closet, the art draws you into their world and makes you feel even more connected to the characters. The voice acting is believable and played perfectly, led by Max Mittleman (Arima) and Erica Lindbeck (Kaori). Kyle McCarley and Erica Mendez--Ryota and Tsubaki, respectively--deliver amazing performances as well. Lastly, the animation is superb with its varying shots. Long still shots countered with frantic scenes of the musicians pouring their hearts out on stage are handled with such care and delicacy, they just add another rich layer to an already amazing series. The amazing list of directors, writers, animators and everyone else who was involved with this series can be found here. What makes this series so incredibly special to me is the authenticity to it. Some of the locations, like the main music hall and Kaori's parent's bakery, are based off of real locations. Sure, some of the dialogue about how the characters look at music can be over the top at times, but the realism in growing up and confronting issues that you thought would never happen to you are things that cannot be overlooked. The way each character is written provides their own unique identity with unique issues. Arima and Kaori certainly have the more emotional storylines, but Tsubaki's dilemma is treated with as much care. Side characters like Takeshi Aiza and Emi Igawa also have well thought out and produced stories to add to the depth of this tale. How I've went so long without talking about the music is almost criminal. It is kind of a big deal. The choices between Beethoven, Bach, Chopin, Debussy and so many other classic composers combined with the breathtakingly beautiful original songs by Masaru Yokoyama combine to make this easily one of the best soundtracks I've heard, be it film or television. I binged this series in two days and have no issue in admitting that I wept like a child during the last two episodes. I couldn't even hold out until the finale. It is emotionally taxing, especially when you can relate to one or two or maybe even more of the characters in some capacity. Maybe I'm just a softy or a sucker for a good love story. 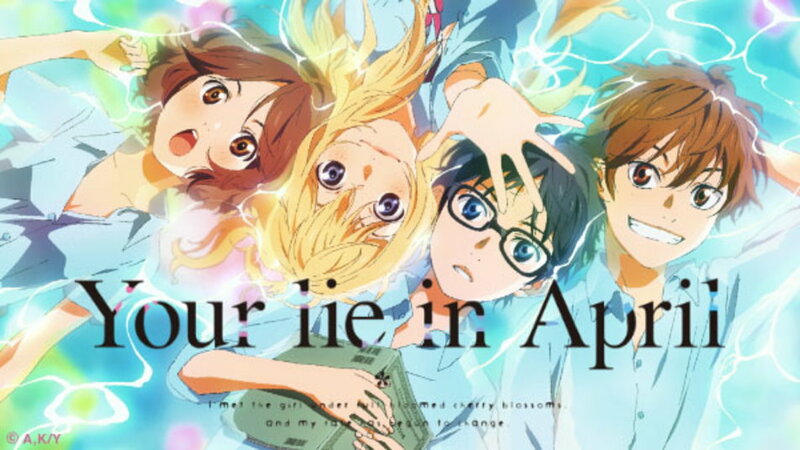 Those statements may be true, but so is this one: Your Lie in April is one of the greatest love stories I've ever seen. The saddest part of my weeping wasn't the fact that series was over, it was that I had to admit to myself that it was a cartoon. A cartoon made me an emotional mess. Unbelievable. Admittedly, I was never the biggest fan of anime. Even growing up during the Pokémon and Digimon peaks, I never really tuned into the shows because I didn't like the style of cartoon. Then again, I was eight or nine years old and did not understand this style. As I've grown up and been able to expand my views with music, film and television, I've been able to develop a greater appreciation for what these series can do and convey. So what that this series is animated? The whole point of television and film is to bring you out of the real world, even if only for a few minutes at a time, and live in another realm. Experience someone else's life and escape. Should it matter how a story affects you, whether it's through animation or with a real cast? I've had a change of thoughts after viewing this series and no, it shouldn't matter. ​A good story is a good story. Great characters are great characters. Locations accompanied with appropriate music make a perfect scene. I absolutely love the title and its ultimate meaning. I love the music, I love the story and its characters. I can't be more happy that I gave this a shot on Netflix. Your Lie in April, to me, is a masterpiece that strikes an emotional chord that will leave you thinking about it for as long as you want to hold the coda. Loved it! It was good It was okay Sucked! I wept like a child!